A word that means so many different things to many different people. Our ideal home verses the home we actually live in. How many of us live not just in a house but what we call a home? To me a home is really so much different to a house. We have lived in many different houses over the years and yet I believe except for our first flat (which was very much less than idea...read disgusting) we have had a home each time. So what is the difference for me between a house and a home? A home is filled with love! A home is the place you would rather be; not just where you check in for refuelling. A home to me is filled with the joy of creating a place for others to come in and be relaxed and nourished, not just physically but emotionally and spiritually too. A home is where people are valued for each and every individual characteristic and encouraged in these gifts. We aren't all the same, we have different abilities and thank God for that. A home for me is an extension of who and what is important in life. So our home reflects these aspects in many ways. For me personally books and crafts are a major part of home life. We have craft items I have created over the years all over the place. Our children as they develop skills are sharing their work with us in our home that have been given in love as gifts. Books are everywhere and I rarely go anywhere without a book and some hand craft. I have noticed that some of our girls especially are carrying these things with them as well. Our children have some musical interests as well so we have musical instruments in our home for them to enjoy, of course Cd's are played often as well. Mostly when I think of home I think of the creative mess that comes with it. I don't think you can have a 'designer look' home and one in which the family circle involved is FREE to pursue these outlets. A home that allows freedom of creativity is a home that will not be CLEAN AND TIDY 24/7. Sure, we try to keep it clean and tidy BUT I will NEVER think that our home can be like this 100% of every day......it can't. Our home is here to nourish us and support us, as we try to do this for one another. We live in our home and we care for it ......BUT we love each other as our first priority. From the moment I opened the book and started reading the first chapter that describes the home that Wren has come to, I knew it was a book I would love! "This is bay farm, a 200 acre dairy farm in Massachusetts. The front of the stone house looks down upon fruit orchards and a small lake as a drive curves its way up through apples, peaches, plums and pear trees to the sand coloured, stone house. The house was not huge but it had grace and a simple grandeur as it overlooked its ethereal domain." I knew that this was the kind of home I would love to have in this beautiful farmland setting. Wren the main character is a newly wed bride of 19 whose husband has gone off to war and she has the task of creating a home for the two of them out of the bricks and mortar of this house. There are so many themes within this book that speak to my heart. It deals with the actual making a home from Wren's surroundings, using her gifts and talents to create a unique and yet loving atmosphere. Cooking is a large component and at the end of each chapter a recipe is shared that Wren has used throughout the previous chapter. Herbs, their beauty and fragrance and their many uses is evident through out. And one of the greatest aspects I love is the learning that Wren has to do. Wren learns to make many new crafts and life skills that would be common place that she has no ability or interest in to start with, and yet she does learn, she does achieve the new goals she sets for herself, I can relate to this so much due to my own learning curve over the years and how if I wanted to learn something new I just jumped in and started. Wren herself is a gentle and giving character who is trying to adjust to a new environment and life situations with a faith in God that is inspiring. This is evident in her daily routine and her 'gratitude book' she writes in each night. The gentle lifestyle although not easy is a gift to share with all who read the book and of course the homeschooling based on Charlotte Mason methods that Wren uses for Lily is once again a beautiful look at Homeschooling and how it can be such a continuation of daily life. I simply love books that through a story can create a warm and generous look at the type of homes we can create if we truly look at the resources and gifts we have and are diligent in applying them to our homes. In fact in many ways I find in Wren a Kindred Spirit and am looking forward to introducing her to our daughters. I was very touched at the end of the story at home much this book could be a kind of introduction for young girls who are looking at the arts of Homemaking. So if you are looking for a new Kindred spirit in literature and a warm, gentle and inviting look into a house that has been made a HOME, I would suggest you get to know Wren! The blessings of the home is contentment." Using these words as a blessing I pray that you each are building homes that will continue on through future generations. oh Gae, I have been wanting to pick up this book since it came out, but alas, I just have too many to read at the moment. Hi Gae! I have enjoyed your blog so much! I love your dedication to home and faith. That has also been the heart of my life! You have so many great goals for your children, especially growing up truly experiencing the liturgical year - the reading - and, of course, the play outside! Could you do me a favor and tell me the name of the artist who did the picture of the porch and also the picture of the two chairs near the fireplace?? I recognize the work but cannot remember the artist! 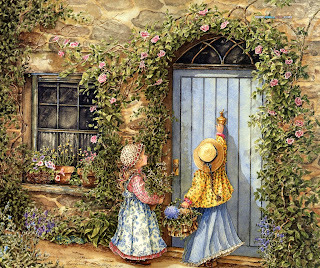 I love Tasha Tudor, too! I whole-heartedly agree with your understanding of "home"! Wren Bay sounds absolutely delightful. One day I shall read her book too. I couldn't agree with you more. My house is looking will never be "designer" I have too many little projects around me but I want my children to feel nourished by our home (I love that you said this!). My mom also had this similiar philosophy, growing up you could find our projects all over the house and of course all of our pets. God bless mothers!The are the gatekeepers of this nourishment. This whole post is so beautiful. And I just LOVE how you put it, "A kindred spirit in literature"! I don't think I've ever considered that thought before!